When our truck or van pulls up to your office for a free consultation, you’ll know when we’re there because “Cubicle Office Environments” is printed on the side of our vehicles. For most people, “COE” is just another company name among thousands of catchy and not-so-catchy business monikers that try to stand out. For us, though, “Cubicle Office Environments” represents the core of what we do – creating an efficient, productive office via new or used cubicles and the subsequent furniture needed to complete your new workspace. In this post, we’re going to address the inseparable link between cubicles and office environments. Over the years, one trend has become the darling of startups and legacy companies across the country: open offices. In these environments, walls are literally torn down and what once was a segmented office space with privacy for each employee becomes an open space where desks and lined up together or are altogether eliminated by incorporating long tables that accommodate multiple employees. In theory, this transition is a move to increase communication in the office and create a space where free thinkers can augment their creativity. While it seems like a great idea in principle, research is revealing that the open office isn’t as revolutionary as once thought. Employees get sick more often because they lose the barriers their cubicles once provided. Productivity goes down because it’s harder for employees to focus – you hear everything, see everything and anyone can come along at any time and distract you. 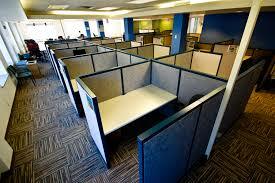 Science shows us what we’ve already known for a long time – cubicles provide the privacy your mind needs to excel. The average person is hard-wired to thrive in spaces that provide us protection from audio and visual distractions. Our cubicles provide the level of privacy your employees need for their minds to sense a level security that frees them to focus, be productive and excel at the tasks at hand. When you contact us for a consultation, we’ll come to your office and measure out your workspace, talk with you about what you want out of your workstations and how your office design can fit with your goals for the upcoming year or years. We’ll then draw up detailed plans that incorporate the customizations you want, providing you with several different options that span multiple styles and budgets, and all without any cost to you. Should you choose to move forward with one of our designs, we order all the furniture, deliver it and install it. While we believe that cubicles provide your team with a more efficient workspace, we also believe that open offices may be a necessity for you because of your bottom line, or that you’ve found a way to leverage your open-office layout to increase your team’s productivity. With that in mind, we offer seven different options for open office layouts. A great example of this is PCF’s Elements benching system, which has eight different variations for multiple-employee workstations. To start your consultation, contact us today and we can help you discuss cubicle or open-office options.